Don't take any photos that may make people feel embarassed. Don't point with your foot. Wear decent clothes when visiting religious sites. Don't tuck away your feet. Don't touch anyone on the head. Don't touch the robe of a monk. Help us keep Myanmar clean. Friendly, helpful, honest, but proud. 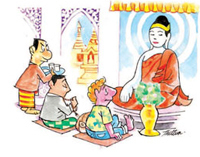 In Myanmar, unlike the Indian continent, nodding mean YES, and shaking head means NO. For hygiene reasons, eat only in decent restaurants. When not available, always eat heated food. Myanmar food are often complained as oily. If sick, don't worry. All doctors are English literate. Don't jay walk. Watch where you walk and what you step on. Tuck away your feet. Don't point it toward the pagoda or a monk. 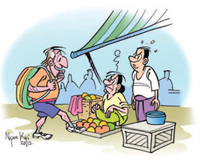 Don't offer food to a monk, nun, or a novice after noon time.